I'm strictly a drug store makeup kind of girl. I love high end makeup but I'm on a housewife's budget. Buying cheap makeup doesn't mean that you have to buy bad quality, though! Here are some of my favorite things that I use daily and swear by. NYX is my favorite makeup brand. With high pigments, smooth application, long-lasting wear and prices just a little more than ELF, you can't beat it! I haven't tried anything yet from NYX that I don't love. I don't have any "steals of the week" this time since most of these are very affordable drug store cosmetics, they're all a great buy! You can find most of these from Beauty Encounter, where you can get free shipping on orders $60 or more and receive discounts with the BE Perks program. Revlon Colorstay for Combo/Oily Skin in 150 Buff- a full coverage, oil free foundation. I compared it to a sample of MAC Matchmasters and it was identical in coverage, color and texture for much less. It is a very heavy coverage, just like MAC but if you want a quick, even application with a flawless finish, it's a great product! Coty Airspun Powder When I was a little girl, my mom used Coty Airspun so I always used it. Coty has been around since 1935. It's a gorgeous, very fine powder with a light flowery scent that reminds me of mom. I'll use any peachy blush but I really like NYX blush in "pinched" I want to try their stick blushes next. NYX eyeshadow base in skintone I never used eyeshadow primers before but since I ordered several of their things I thought I'd try the eyeshadow base. 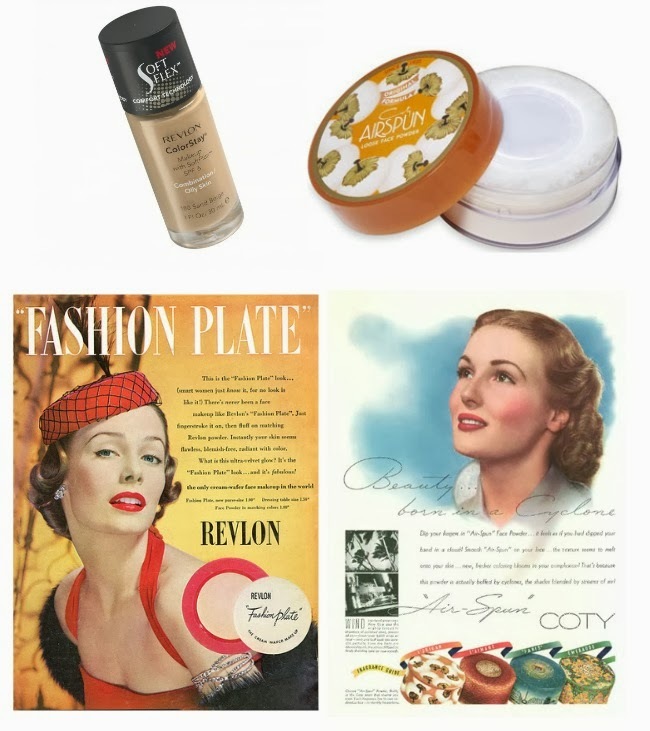 This is a great primer, which lasts an eternity and I often wear it by itself for a classic and clean 1940s look. Gel Liner - for the lower lash line, I use a super fine brush to line from the center lash to corner and out. Bunny gave me a Stila Smudge Pot when she came to visit and I love it! I've been using it daily since April and have barely made a dent in it. Stila takes a bit longer to dry than other gel liners. 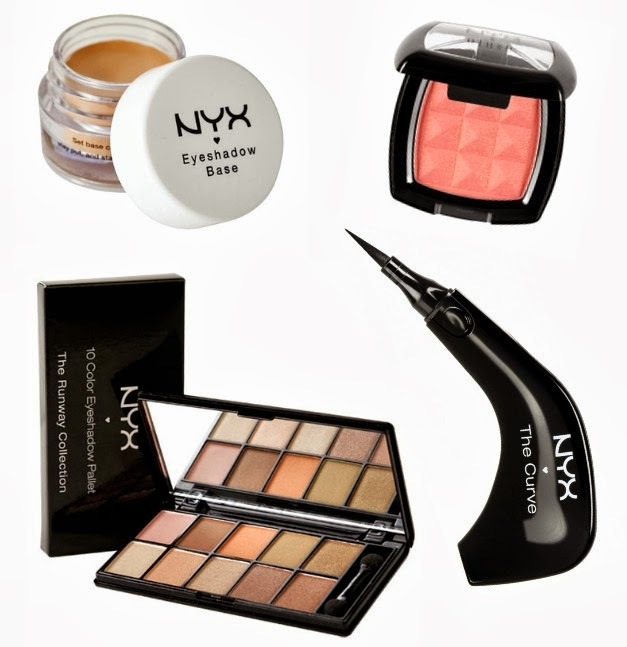 Do you have any favorite drug store makeup products? Oh I like Rimmel too! I had one of their dark brown eye shadows that I used for a brow filler for ages and it was great! Thanks for the tips! I only buy drugstore makeup, too, and I need a new foundation soon - mine only matches my summer face and the winter pale is setting in quickly this year. I've just discovered your blog and I loooove it! 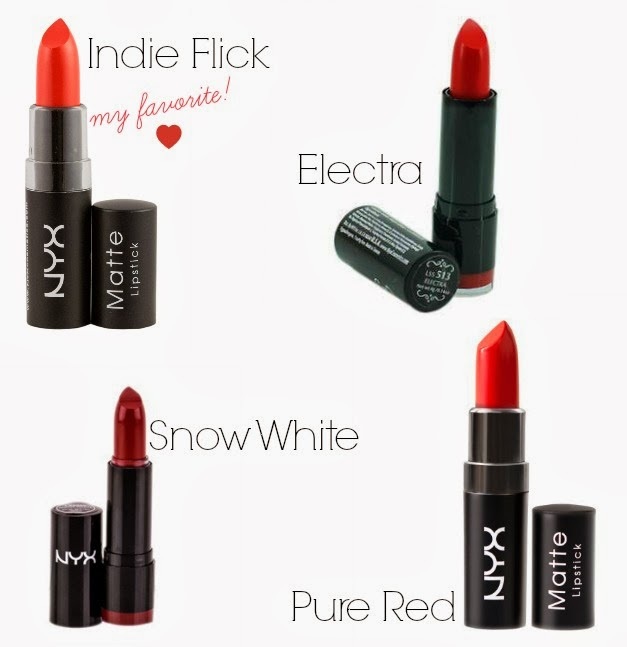 I love NYX but I haven't tried any of their lipsticks yet - I love the shades that you've included here so I must look into getting some for myself. I haven't tried NYX. I have always used AVON products. I really love their glimmer sticks eye liners. What a blast from the past! 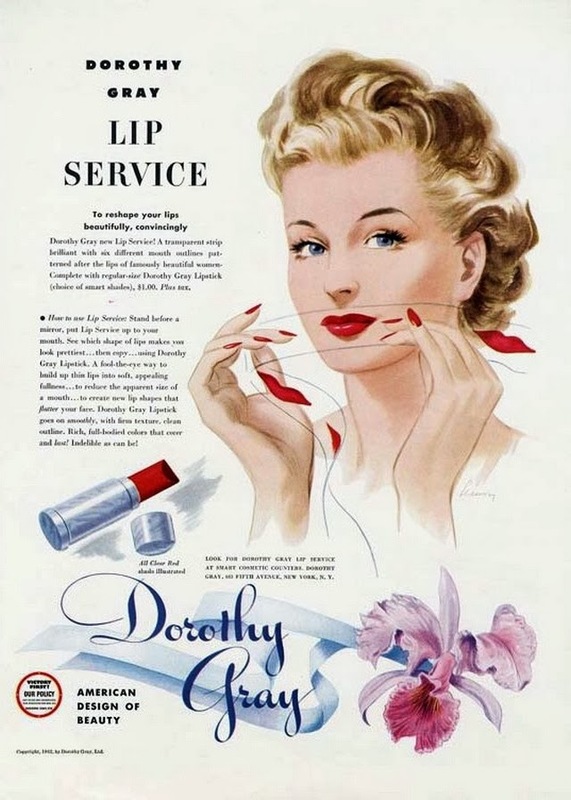 The Dorothy Gray Lip Service! I remember Mom having eyebrow stencils, too. Such a hoot, I sure wish they were still around...now that they're vintage! Fantastic post, my fellow drug store makeup wearing gal! I do have a small number of department stores items (such as my beloved Russian Red lippy) in my bag, but not many. I love makeup, but I tend to stick to the same handful of items and would usually rather spend my modest budget on clothing (or craft supplies) than high end cosmetics. Sometimes for special occasions like my birthday, Tony will spoil me with a few though. He has great taste at picking things out and was actually the person who first bought me the Diva lipstick from MAC, which has been one of my three most frequently worn lippy shades ever since. Usually though, it's drugstore all the way and that works just fine for me, too. I'm a huge NYX fan as well, and I always use Maybelline mascara. I don't think MAC is remotely worth what they charge for lipstick when their Mattes are so drying. I love NYX mattes and Revlon reds for lipstick. I do use a LOT of theBalm products, but only when I can get it at drugstore prices on HauteLook. I haven't tried NYX yet. I will have to try it. I like the Coty powder and it's pretty much the only one I use unless someone gives me something expensive like Estee Lauder, for a gift. I actually really like ELF eye shadows because they have a bit of sparkle. But I haven't tried any of their other stuff. I like L'Oreal Truematch for my foundation because I need the palest color I can find and it seems to be it. I must look out for NYX when we go the States next year - those lipstick colours look really nice! (side note - I wish MAC eyeshadow was $15 a pop over here - it retails for $33 AUS/$30US, eep). Great post, and just in time: a store opened here that carries NYX! I'm currently using their concealor. I'm also a big fan of Revlon matte lipsticks, as they stay in place pretty well. Max Factor Pan Stick is the best concealer you can use. I don't use it as a foundation, which is how it was designed but, rather as a cover stick. Because it comes in many more, better matched shades, it does an excellent job and hiding dark circles and little flaws without getting cakey, white eyed or actually highlighting those tiny lines. With Pan Stick and a good Airspun powder on a well-moisturized face, I generally don't need foundation. And it lasts forever! If you want to keep that dewy fresh complexion for years into your forties, gals, start now by using as little makeup as you can get away with. Serious, the less you use, along with sunscreen, the less you'll have to hand;e your face to apply AND clean and the longer your complexion will look great. Oh, and I never fail to get compliments on a shorter nail manicured with Revlon Red. It's an elegant classic and it seems to stay put without chipping a long time. I always noticed that the starts I adored, Grace Kelly, Katherine Hepburn and Audrey Hepburn rarely had nails that went past their very tips of their fingers.